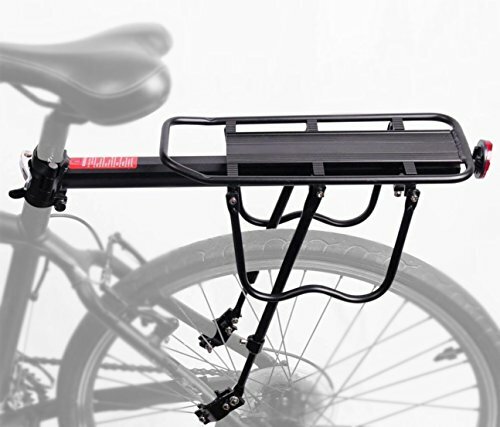 PEXIQAKA Bike Carrier Rack 110 LB Capacity Solid Bearings Universal Adjustable Bicycle Luggage Cargo Rack by PEXIQAKA at Idaho Velo Park. MPN: PK1850-1. Hurry! Limited time offer. Offer valid only while supplies last. Includes Red Rear Reflector Lamp and Elastic Cords, which can make you safer to riding at night and keep your luggage secure. With side protecting frame, your luggages are protected from scratching by the wheel or spokes. If you have any questions about this product by PEXIQAKA, contact us by completing and submitting the form below. If you are looking for a specif part number, please include it with your message.